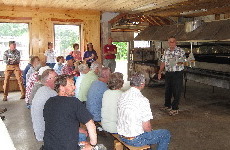 Membership in Minnesota Maple Syrup Producers' Association is open to all persons interested in maple syrup or firms engaged in any phase of producing, processing and/or marketing of maple syrup. See below for membership benefits and how to apply for (or renew) membership. Membership meetings: Held twice annually, in the spring and fall, at locations rotating around the state. Information is shared, industry issues are discussed, producer questions are answered and equipment is demonstrated. A highlight of the annual meeting, held the third Saturday of May each year, is the maple syrup “contest”. 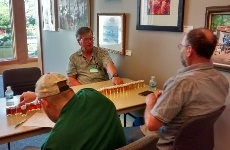 Members are encouraged to enter samples of their syrup to be evaluated and judged on the basis of color, clarity, density (correct concentration) and flavor. Following the business meetings, nearby sugar bush and production facilities of members are toured. Friendships are made, sugar house and equipment set ups are observed and ideas are exchanged. Members of the MMSPA are eager to share ideas with fellow producers, especially new producers wanting to learn what “sugaring” is all about. Newsletters: Members receive (and can contribute to) the official newsletter of the MMSPA, "Minnesota Maple News", each quarter. 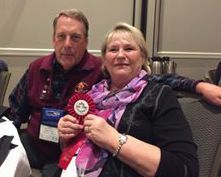 Members of the MMSPA also receive the Maple Digest, the official publication of the North American Maple Syrup Council. This is the official website of the MMSPA (mnmaple.org). In addition, information and communications are shared at each membership meeting and with special mailings to members as needed. New Member: To register online, select a membership plan (Single, Family or Business for Annual or 3 Year option) and then click the "Sign Up / Renew" button. Complete the requested profile information (new user) and submit your membership application for processing. Note: you must have an email address to register online. Existing Member: To renew your membership online, select a membership plan (Single, Family or Business for Annual or 3 Year option) and then click the "Sign Up / Renew" button. You will be prompted to log in (alternatively, you could use the Member Login link at the top of the page). Once you have logged in, you can renew (or upgrade) your membership, or you can update your member profile information. Click the button below to SIGN UP for a new membership or RENEW an existing membership.